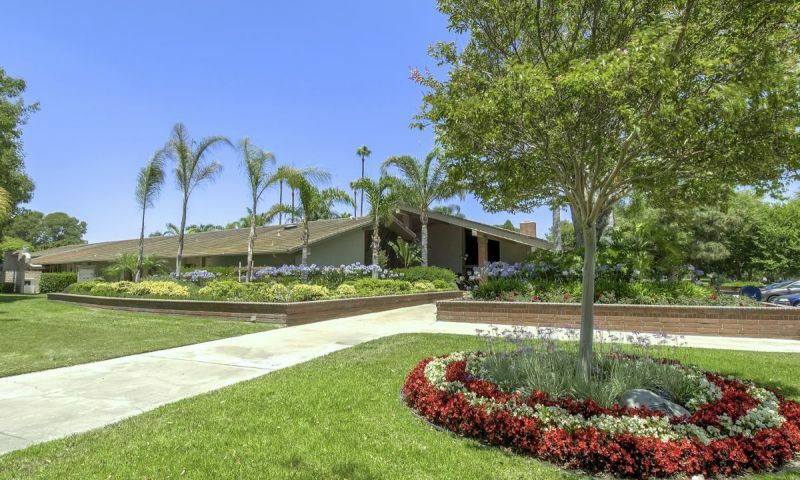 Huntington Landmark in Orange County, California is one of the premier 55+ communities in the Southern California area. With over 1,200 homes, homeowners can choose from a large assortment of condominiums and townhomes available on a resale basis. These low-maintenance homes allow residents to live a fulfilling active lifestyle. Residents can enjoy golf, tennis and countless other activities in Huntington Landmarks beautiful clubhouse. There are over 25 different clubs and interest groups in the community. With miles of pristine beaches, ideal weather, a welcoming attitude, and a wide variety of entertainment options, Huntington Landmark in Southern California is the perfect active adult community. The stunning clubhouse boasts a bountiful lineup of amenities uniquely crafted for the needs of today's active adult buyers. The athletically inclined can enjoy the fitness center that includes weight-training and cardiovascular equipment. Hobby and craft-minded residents will never find a shortage of activities at the community clubhouse. There are several multi-purpose rooms that include an arts and crafts studio, ceramics studio, woodworking shop, and hobby and game room. A grand ballroom with a catering kitchen plays host to many activities such as dinner parties, receptions, movies and community events. Residents also have use of a library, billiards and a continuing education center. Outdoors, the clubhouse provides horseshoe pits, shuffleboard, volleyball, pickleball, and tennis courts. Residents also enjoy two resort-style pools with a beautiful patio where they can soak up the California sun. Residents can embrace the scenic setting of mature trees while taking a stroll on the walking and biking paths that wind throughout the community. Huntington Landmark also offers R.V. and boat parking for residents. Those who love the water and beaches will also be happy to know that the Pacific Ocean is about a mile away. Huntington Landmark began construction in 1972 and the community was completed in 1986 with 1,238 homes. Since Signal Landmark began building, they have offered eight different floor plans in a variety of housing styles. For homebuyers who want the ultimate in maintenance-free living, there are a variety of ranch-style townhomes and two-story condos in Huntington Landmark available on a resale basis. The monthly association fee includes full lawn care, exterior maintenance and access to the amenities. There are 45 two-story condo buildings with a total of 360 units. There are four floor plans that range in size from 860 to 1,132 square feet. These residences feature one to two bedrooms, one to two bathrooms and a carport. There are 878 attached homes that range in size from 1,074 to 1,336 square feet with four models from which to choose. These homes feature two to three bedrooms, two bathrooms and a carport or one-car garage. Huntington Landmark offers the ultimate in active adult living. There are over 25 different clubs and interest groups that cater to nearly every imaginable interest. A full-time activities coordinator is continually updating an action-packed calendar filled with new and exciting events, parties and group trips. Whether your interests include fitness activities such as aerobics, golf and tennis or more hobby-related activities such as ceramics, woodworking or arts and crafts there is something for everyone at Huntington Landmark. Card and game enthusiasts can partake in clubs such as bridge, billiards and Scrabble. Sports enthusiasts will enjoy clubs such as tennis, yoga and golf. The music club and chorale group are perfect for people who enjoy performing arts. The list of activities is endless and every month residents receive a new monthly newsletter that highlights all of the fun activities at their disposal. The welcoming community gives residents the chance to exercise their bodies, expand their minds, engage in hobbies and make new friends. Huntington Landmark is located in Huntington Beach, California just one mile from the Pacific Ocean. This desirable location in Huntington Beach is also known as Surf City, USA. The Huntington Beach Pier and Main Street overflow with a variety of restaurants, shops and many attractions to support the beach lifestyle. Residents are within walking distance to major shopping such as Vons Center. Huntington Landmark is conveniently located near many Orange County attractions including Disney Resorts, Orange County Performing Arts Center and Repertory Theater. San Diego is located 95 miles southeast while Los Angeles is only 35 miles northwest. The John Wayne, Long Beach and Los Angeles International Airports are close by when farther travel is on the schedule. Huntington Landmark is the perfect active adult community for those looking to live in Southern California. There are plenty of activities available in Huntington Landmark. Here is a sample of some of the clubs, activities and classes offered here. There are 45 two-story condo buildings with a total of 360 units. There are four floor plans that range in size from 860 to 1,132 square feet. These residences feature one to two bedrooms, one to two bathrooms and a carport. These low-maintenance homes also have a balcony or patio perfect for enjoying the California sun. The attached homes are perfect for those who desire a little more living space. There are 878 attached homes that range in size from 1,074 to 1,336 square feet with four models from which to choose. These homes feature two to three bedrooms, two bathrooms and a carport or one-car garage. Huntington Landmark reminds me of the good ol' days. It's really casual and friendly here and the location can not be beat. We're a mile from the ocean, the weather is amazing and you can walk to some shops and restaurants. We've got a gated entrance with an actual guard so we feel very safe here. We have done updates to our home since moving in a few years ago and are very pleased with the everything. Most important, the neighbors here are really nice people and have made us feel very welcome. I even took up ceramics and have been amazed at the things I have made! 55places.com is not affiliated with the developer(s) or homeowners association of Huntington Landmark. The information you submit is distributed to a 55places.com Partner Agent, who is a licensed real estate agent. The information regarding Huntington Landmark has not been verified or approved by the developer or homeowners association. Please verify all information prior to purchasing. 55places.com is not responsible for any errors regarding the information displayed on this website.